C e.nturies ago, Milo the Wrestler was the first to use progressive resistance exercises to improve his performance. Legend says that he became able to lift an ox by lifting a baby calf each day until the calf reached its full growth. Since then, many advances have been made in our ability to develop muscular strength -- isotonic. ' isometric, and hiokinetic approaches all have their place. Now, work at the Coto Research Center in Southern California enables modern coaches to use a micro-computer to maximize the strength-training,-program for their teams. 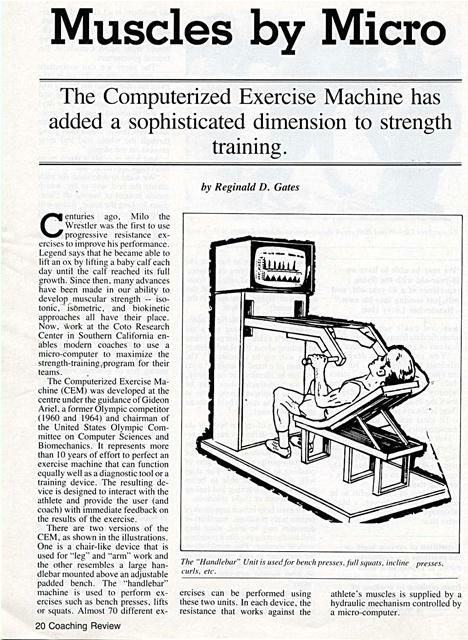 The Computerized Exercise Machine (CEM) was developed at the centre under the guidance of Gideon Ariel, a former Olympic competitor (1960 and 1964) and chairman of the United States Olympic Committee on Computer Sciences and Biomechanics. It represents more than 10 years of effort to perfect an exercise machine that can function equally well as a diagnostic tool or a training device. The resulting device is designed to interact with the athlete and provide the user (and coach) with immediate feedback on the results of the exercise. dlebar mounted above an adjustable curls, etc. athlete's muscles is supplied by a hydraulic mechanism controlled by a micro-computer. The computer senses the position and movement of the machine thousands of times a second via a special set of electronic "black boxes", and varies the resistance opposing the athlete by adjusting the hydraulic pressure through another set of electronic devices. This ability to dynamically sense and control the resistance during an exercise is the heart of the CEM. The machine can provide any pattern of resistance desired, varied according to both force and time. Dr. David Costill of the Human Performance Laboratory at Ball State University in Indiana says. "Its capability to be programmed for a variety of isometric, isotonic, biokinetic, and progressive resistance protocols is a unique quality found in no other form of equipment for muscular development". The advantage of this approach can he seen best via an example. Suppose one of your players can bench press 90 kilograms using free weights. It's important to realize this this 90 kg. does not represent the maximum force that lie can exert at every point in the exercise -- it represent; the maximum that he can lift at his weakest point. The weakest point (in this case) is at the start, since that's where the biomechanical arrangement of his arms, hands, and shoulders give him the least leverage. At the point where he is the strongest biomechanically, the player may be able to exert 140 kg. of force. After training for six weeks the player can now press 110 kg. He has increased his "minimum" by 25 per cent, but has he increased his niaximuni by 25 per cent, i.e., can he now exert a maximum force of 137.5 kg.? The answer is no. The player has increased his maximum some, since some of the same muscles are involved, but he did not stress his maximum beyond the "old" limit of 140 kg. He did not get nearly the same benefit from the training as measured by comparing the increase at the minimum to the increase at the maximum. both weak and strong. are overlooked and development occurs much more rapidly. if the force expended is graphed as a function of time, it would appear as shown in Figure I. The straight line shows the free weight force as a constant. while the curve shows the force exerted using the CEM. develop isometrically, and then let them complete the exercise. 4. Have them repeat rapid halfsquats until the total force during the most recent half-squat is fifty per cent of the force expended during the first repetition. : his is known as fatigue sensitive training. In fact, you could train different players using different approaches and then use the CEM to evaluate which method gave the "best" results. Typical force curves for a bench press using free weights vs. a bench press on the Computerized Exercise Machine (CEM ). The CEM will resist the user with the maximum "weight" he can lift at each point during the press. When the biomechanical arrangement of his body permits the user to exert more force, CEM increases its resistance. proved 33 per cent and Group 3 (the joggers) improved 19 per cent. Interestingly, Group 3 actually decreased in muscle strength during the project. Dr. R.A. Berger of Temple University concurs with their findings and reports. "... work can he uninterrupted between lifts so that no recovery occurs. As a result. the stress on the circulatory system is maintained". One of the best features of the CEM is that it is designed to give the user immediate audio and visual feedback on their performance. The computer produces a color bar chart display on a monitor visable to the athlete during the exercise. The user can tell at a glance the amount of work done (e.g.. the number of repetitions) andd see the force expended versus the desired force pattern. In addition, an audio signal is produced by the computer at the completion of each movement and at the completion of a set. The computer stores the results of each set and can produce a printout comparing today's results against the previous results for the same set. This provides an objective record of progress in training, that can he reviewed at any time. One of the obvious uses of the comparative ability of C:EM is in diagnosis and rehabilitation, where the normal force pattern or the force pattern for the athlete prior to the injury is compared to the results after rehabilitation. 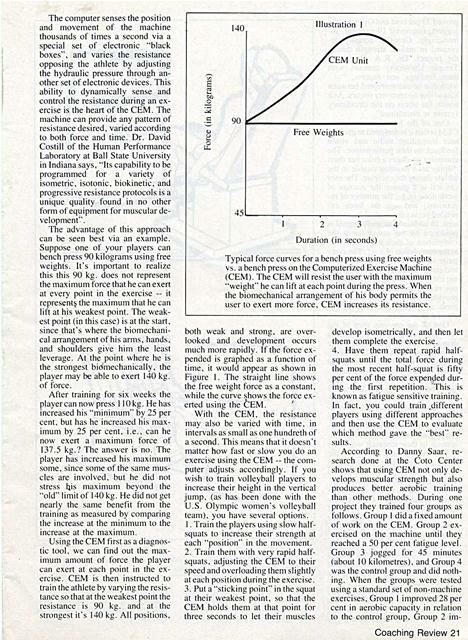 The CEM can also he used to measure the effectiveness of one training regimen over another. In this connection, the Canadian Forces Base t)ownsview. Ontario have purchased two units to he used for diagnosis in their research work. shows wide variations as the subject	involving the cams (e ., '. ..loremin curls). The Coto Research personnel them. All types of exercise have program for your team, the Cornemphasize that the CEM is an their place in the training program puterized Exercise Machine has advancement on previous training (and their proponents). However, definite advantages that should be methods. not a replacement for	when evaluating the total training	considered. The Coto Research Center is located in Trabuco Canyon, midway between Los Angeles and San Diego in Southern California. The center provides biomechanical analysis using a variety of machines and techniques, including the Kistler Force Platform and the Selspot 11 system. 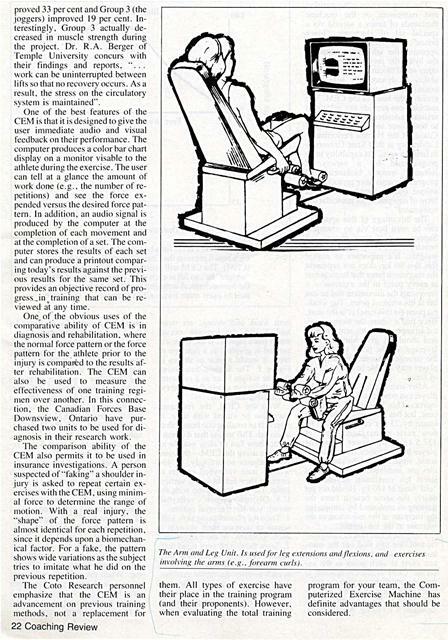 as well as the Computerized Exerise Machine. 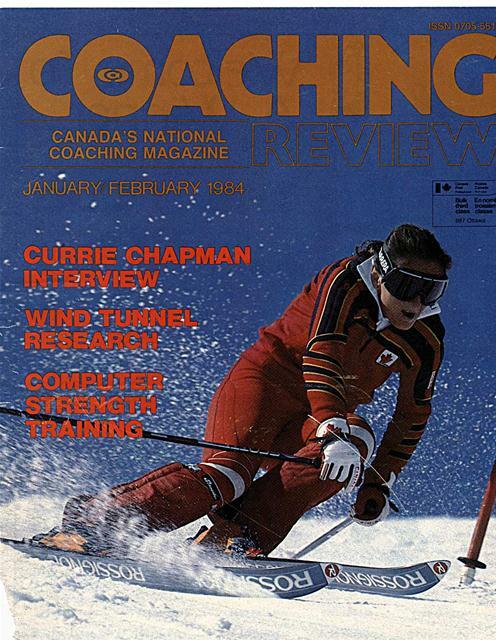 They have analyzed many Olympic teams for coaches in the United States and other countries such as Germany. England. France. Italy and Spain. The sports involved included swimming. gymnastics. cycling. fencing. volleyball and diving. 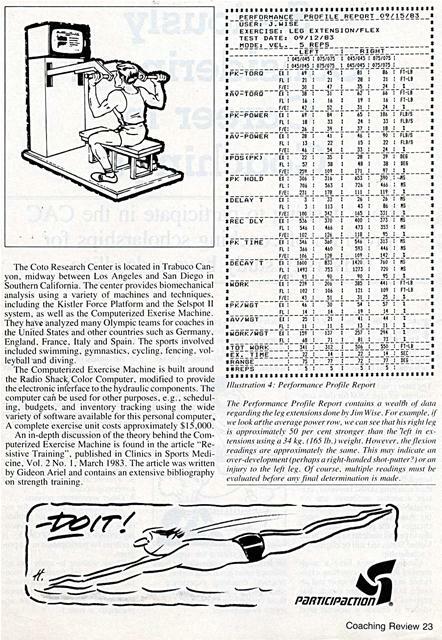 The Computerized Exercise Machine is built around the Radio Shack. Color Computer. modified to provide the electronic interface to the hydraulic components. The computer can be used for other purposes. e.g., scheduling. budgets, and inventory tracking using the wide variety of software available for this personal computer, A complete exercise unit costs approximately $15,000. An in-depth discussion of the theory behind the Computerized Exercise Machine is found in the article "Resistive Training", published in Clinics in Sports Medicine. Vol. 2 No. I . March 1983. The article was written by Gideon Ariel and contains an extensive bibliography on strength training. The Pertornianee Profile Report contains a Iyealth o/ daui regarding thelei e.iiensio,zs done by ./i,n Wise. For ev(:In/)le ii' u'e look crrthe average polrer row. Ire can see that his right /e,L' is approximately 50 per cent stronger than the 7ee%t in extensions using (134 kg. (165 lb.) it-eight. Houï¿½ei er. t/re /1e.tion readings (irï¿½e appro.virnately the same. This menï¿½ indicate an over-development (perhaps a ri,J ht-bonded shot-pictter:' 1 or all in1.ur v 1o the left leg. 0/ course, multiple readings nnrst be e'veditatcel before an) -final determination is made. Generated on 4/20/2019 3:13:11 PM (PST) ADI/HQ/GBA/2019/ARIELCLOUD/v3.0.2018.0126.